Winter is over and the warm weather has kicked in. Yipee! Yea! Double Woot! Except I don’t always feel like celebrating. Half the time I still need a blanket with me because I’m cold. However, that’s not in the physical sense. My heart is the part that’s feeling kinda frosty these days; on and off. I’m feeling left out in the storm by people that I thought cared about me. They don’t want to hear me; and I feel confused, lost, alone, insignificant, and empty. During those times when our hearts are heavy and we feel far from Jesus, it can be a very ‘cold’ feeling. Being away from God tends to leave us feeling rather ‘chilly’. It’s the same feeling of a cold, stormy winter day. The last thing you want to do is venture outside into the weather, but suddenly you find yourself smack in the middle of it, like it or not! 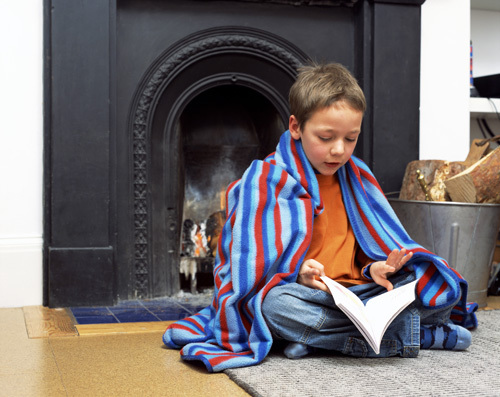 All you long for is a big arm chair next to a fireplace; with a blanket, and a good book. My blanket scriptures help me to feel relief from fear, depression, loneliness, feeling far from God, when I need to forgive, when I have sinned or I’m feeling hopelessly broken and rejected. I’ve learned that my blanket scriptures really do keep me warm. I’m single and alone; so most of my time I have no one to talk to or to confide in. My blanket scriptures is all I have to keep me warm; but they’re all I really need. What are your issues? What are your blanket scriptures? I suggest writing them on a list and taping them to the inside cover of your bible so you have it handy whenever you need that warmth. So next time you’re feeling a ‘chill’ curl up in a big arm chair with your bible and wrap yourself in those blanket scriptures. ~~ Dear God ~~ When I close my heart to Your warmth, and focus on the cold blown around me by the enemy, it can feel confusing and freezing. Please do not ever let me feel that chill ever again. Thank You for the comfort that I can only get by wrapping myself in Your blanket of warmth. In Jesus name, AMEN. This is a lovely idea, Carley... I'm going to have to put some thought into it... the Psalms are definitly a blanket for me... and much of Isaiah. I get what you say about feeling a little left out in the 'cold'... a favourite (and blanket ) phrase of mine is by Edwin Markham... it never fails to warm me: "He drew a circle that shut me out. heretic, rebel, a thing to flout! but love and I had the wit to win... we drew a circle that took him in!" Thank you so much Ramona. I love that quote! Thanks for the comments, and thank you so much for sharing the inspirational quote. Many blessings to you. HUGS. Thanks for sharing the verses! You are so very welcome. I'm glad you liked it. Many blessings to you. HUGS. Thank you for the wonderful support. Very inspiring. I'm glad you liked it. Many blessings to you. HUGS. AWESOME! Thank you so much Shario. I always love to get more, and to know what others find comforting. I found out when I was a new Christian that many say "read your bible", but as a new Christian I didn't know where to go to read what I needed at the time. It's what inspired me to write the topic index list and this post. I'm glad that you could add to it! I'll add them to the Topic Index page when I update it again. Many blessings to you. HUGS. You are right sometimes the only blanket you have is the word. Thank you for the wonderful support. I'm glad you liked it. Many blessings to you. HUGS. Thank you for the support. I'm glad you liked it. Many blessings to you. HUGS. Enjoyed reading your blog and I read the scriptures..... needed this today. Thank you for the support. I'm glad it helped you. Many blessings to you. HUGS. Thank you for sharing this - it helped me. I like that. Ps. 139 has been a favorite for a long time. It comforts me to know that nothing can happen to me that is a surprise to God; and nothing can happen for which He doesn't already have a solution. He will never leave me nor forsake me, nothing more comforting than that - all I have to do is trust and obey. Thank you for the wonderful feedback. I'm glad you liked it. I've found myself reading Ps. 139 myself many times. Many blessings to you. HUGS. Thanks for your blog. I love the phrase blanket scriptures. Like most, I have my own. I'm glad you shared yours! Good Luck reaching Your Goals!! Psalm 91 is my Blanket Scripture. Thank you for the feedback. I very much appreciate it. I'm glad you liked it. Many blessings to you. HUGS. Psalm 23 is my Blanket Scripture. Thank you so much for an awesome blog. Blessings to you always my friend. Thank you for the wonderful support, and your kind words. I'm glad you liked it. Many blessings to you my friend. BIG HUGS. Jesus promise that He goes to prepare a Place for me. That He never leaves me or forsakes me. Thank you for the support. I'm glad you liked it. I love that scripture verse too. Many blessings to you. HUGS. Thank you for the support. I'm glad you liked it. I've gone to Ps 23 many times myself. I even have it on a small tag on my key ring! Many blessings to you. HUGS. I have written these down. I am so depressed today I did not even make it to bible study at church because i did not want to see anybody or pretend that i am happy. Thank you for the support. I'm glad you liked it. I hope you get many blessings from these scriptures. I am concerned about you though. I hope this depression doesn't last. Often for me when I don't feel like going out is when I force myself to do it. I've never been sorry for spending time with my church family or at a bible study. Also, music helps me A LOT, as does exercise. Eating your way through it is not the answer. God loves you, and so do I. He wants more for you. HUGS. Thank you Carly for this idea of blanket scriptures. I often need such a blanket and I now have a start on some blanket verses to put inside the cover of my Bible. I wish we lived close. I would like to meet you. Thank you for the support. I'm glad you liked it. Many blessings to you. I'd like to meet you too. If you're ever going through the Barrie, Ontario area, drop me a line & we can meet for lunch or something. HUGS. Dear Carley, WE are here for YOU on Spark when you need a virtual HUG ! Thank you for commenting. I hope you liked it. Many blessings to you. HUGS.